This is also the first of what might be a series of products I work on as creative director. I’ve spent a decade being a critic and I’ve warmed up to the idea of getting into the product design captain’s chair for a change. Who knows, maybe I’ll like it? I’m not going to pretend as though everyone is destined to love what I come up with. I’m not going to take any commentary people have about products I help create personally. Though I will correct anyone I notice misinterpreting my intentions. If you buy the Laco RAD-AUX watch, aBlogtoWatch will make some money. So will other people involved in the project. We don’t work on margins that are unreasonable and we only seek to deliver authentic watch enthusiast gear. Now that I’ve said that, I hand your attention over to Matt to introduce you to the Laco RAD-AUX limited edition watch inspired by the Fallout computer game universe. A great story makes a great watch, but can that story be a work of fiction? Based on the Laco Auxiliary Observer, or “RAD-AUX” Limited Edition timepiece, we think you’ll agree it can. 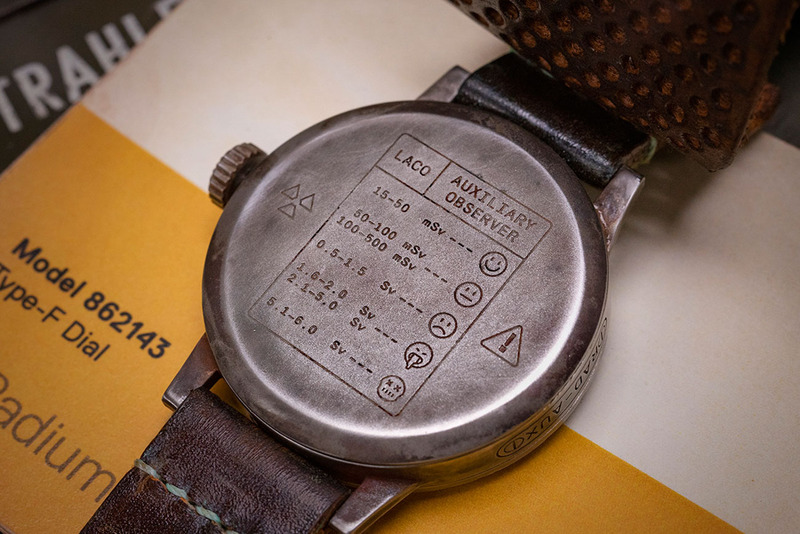 As a “wearable piece of conceptual art,” the Laco RAD-AUX is a functional tool watch, designed for the necessities of an alternate reality: the Fallout gaming universe. In conversation over creating a watch, I (Matt) recalled experiencing an installation by the artist Iris Häussler. The installation titled “Ou Topos—Abandoned Trailer Project” featured a collection of strange artifacts, which were displayed in a vacant parking garage. The setup to the exhibit described city officials finding and removing a strange, abandoned trailer from a Toronto parking lot back in 2009. Filled to the brim with odd items, the trailer seemed to come from an alternate reality. You would enter the exhibit and be able to examine the recovered trailer, along with a cataloged assortment of contents that were removed from it. If you stayed long enough, you could figure out the story that the items tell. After seeing the exhibit, I started thinking how I would love to tell a story through objects alone. This was back in 2012, and I remember leaving that exhibit thinking that at least part of the story had to be real. But no—it was all make-believe. It was that convincing, and it stayed with me. The idea of an ‘alternate reality artifact’ seemed like a great idea to both Ariel and myself. Something that had a story to tell. Since celebrated watches are typically linked to some historical narrative or moment, the idea of creating a watch to suit a fictional lore seemed viable. After much discussion, we realized in order to make the concept work, the watch would have to connect with an existing or familiar story. And that is when Ariel suggested we base the watch on the Fallout universe. I loved the idea since it’s such a well-constructed lore and the game has such a great aesthetic. 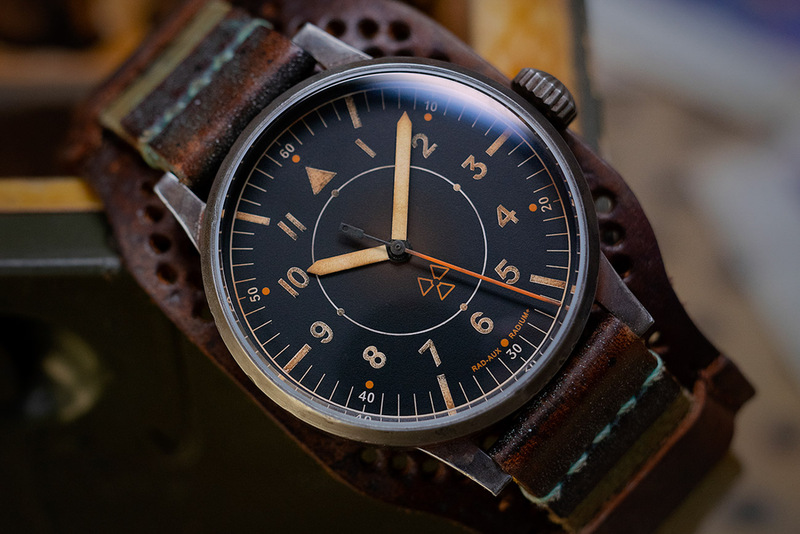 Since the watch would need to look as if it had survived the trials and tribulations of a wasteland wanderer, we settled on designing a watch for the German brand Laco. Watches from the German brand had the right ‘tool watch’ look they were after. 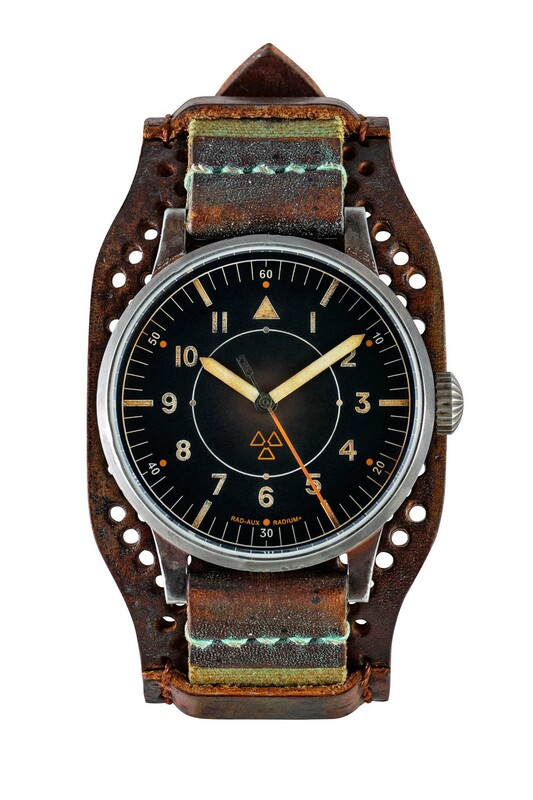 They also have the Erbstuck collection—watches that have been hand aged to look hard-worn and very realistically aged. It was a perfect fit. 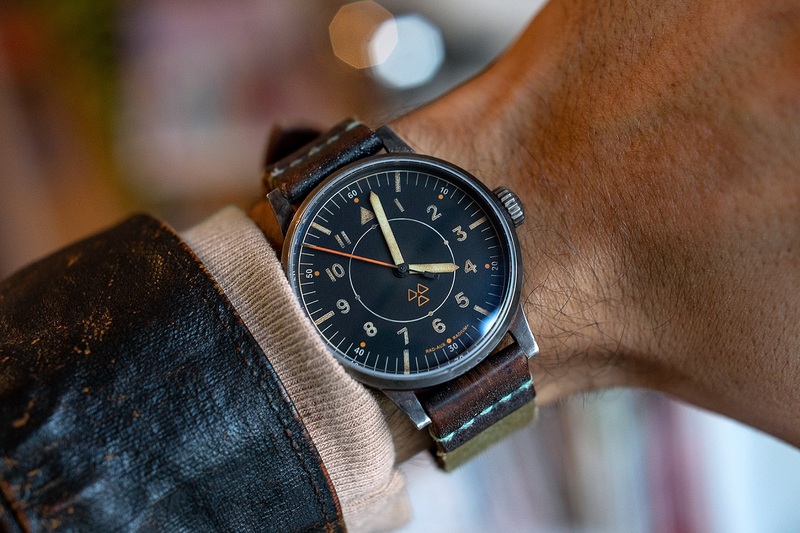 With the history of mechanical watches often used as a redundant system by aviation, space and military operations, they decided the piece could be a redundancy for the Pip-Boy. For those who aren’t as familiar with Fallout, the Pip-Boy (or “Personal Information Processor”) serves as the main gadget worn by every vault-dweller. It’s your in-game menu for items, location, health, and most importantly for monitoring radiation levels within the player. Should the Pip-Boy fail, a Laco RAD-AUX can be used in conjunction with a rad-meter to time your exposure to radiation. It can also help you calculate the rate of fallout per hour, so you’d know when it was safe to leave the vault. 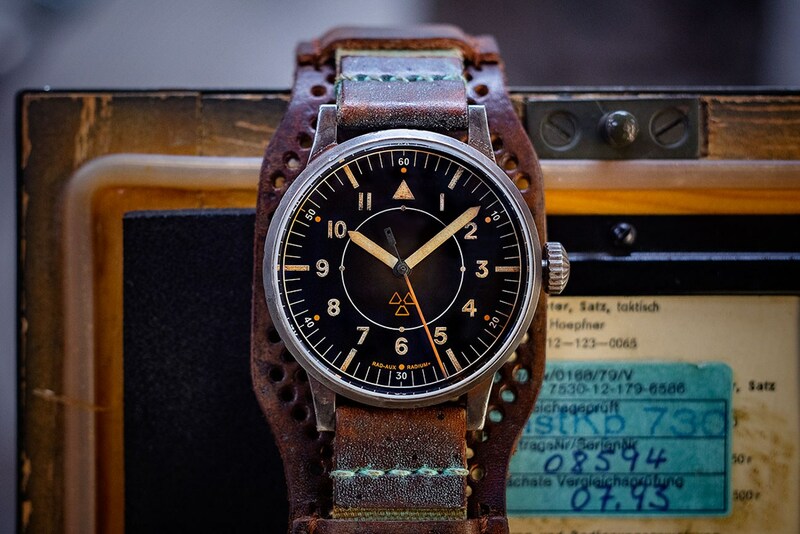 At 42mm in diameter and 13mm in height, the Laco Auxiliary Observer has the same flat-lugged Flieger style case Laco is known for. The onion crown has been replaced by a more modern looking crown, which sits closer to the case but is still sufficiently textured for easy use. RAD-AUX has been inscribed where it would typically read “FL23883”, and a set screw sits at either side of the inscription. The dial of the watch depicts a ‘fallout shelter’ style rad symbol at 6 o’clock with Arabic numerals for each hour and at every tenth minute. Stylistically, it fits on with the design history of Laco and looks like a believable evolution from the well known Type-B dial. According to the manual, this watch has been fitted with a Type-F dial. Finally, if you pull the long end of the strap out of the perforated bund, you can view the humorous yet accurate rad-dosage guide. The watch uses an ETA-2824.2 movement and is made to the same high standard as any other functional tool watch. It’s certainly believable, and Laco’s Erbstück aging process adds to the legitimacy of it all. 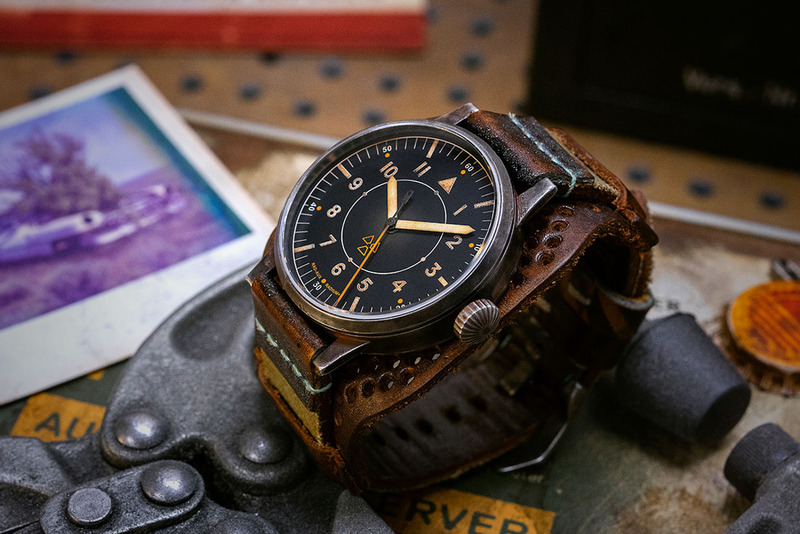 In some ways, the faux patina has made something from a work of fiction all the more real. 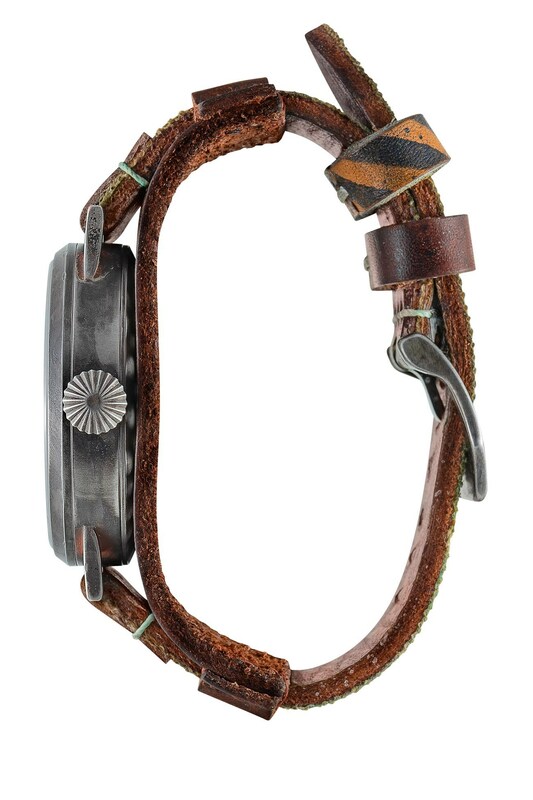 Made from both canvas and leather, the strap features lots of interesting textures and details. It has a branded Pre-V style buckle, caution-striped keeper, and the most interesting bund you’ll find. Being perforated, it conforms to your wrist while remaining breathable, and really completes the look of a watch that could stand in for the Pip-Boy. There is also a #43 stencil on the short side of the strap, which is much more apparent if you choose to wear the watch without the bund. And the watch is definitely wearable. It’s not an oversized prop, and you can certainly just wear it with jeans and a t-shirt. You don’t look like you’re going to attend a cosplay convention. The presentation of the watch is another way it connects back to the Fallout gaming universe. On the outside of the heavily-worn tin box, we see a stamp showing that it was issued to the Overseer of Vault #43. Inside the box, you’ll find the Laco RAD-AUX, a user manual (we’ll come back to that), and an accumulation of a few odds and ends. Presumably, the additional artifacts were collected by the owner of the Laco RAD-AUX before it was discovered. 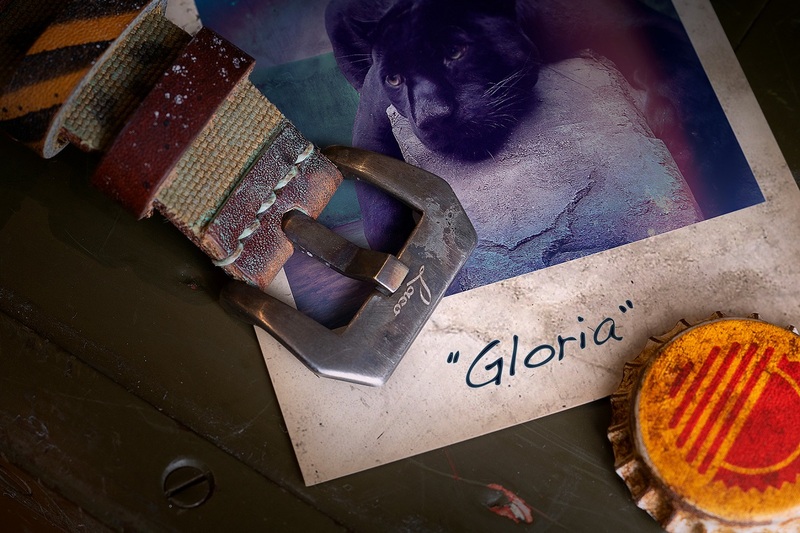 There are realistic Polaroid-style photos depicting abandoned landscapes, mutated plant-life, and a curious panther named Gloria. A bottle cap bearing the mark of a sunset, which has been turned into a pin. There is also a New California Republic ’protection postcard’ which instructs you to place it near the entrance of your domicile, and each item included looks realistically tattered and aged. The user manual gives a great glimpse of how the timeline divergence of Fallout has influenced some aspects of the watch industry. Namely, the opening blurb on the use of “Radium Plus” for Laco’s alternate reality watch dials. But don’t worry, “Radium Plus” is just the brand name in this reality for strontium aluminate phosphor, or Super-LumiNova as we have come to know it. However, the blurb humorously downplays the horrific side-effects of original Radium, which is pitch-perfect for the tone of the Fallout timeline. Another page highlights the radiation dosage to harm chart engraved on the caseback while reminding you to carry your Laco RAD-AUX and spare radiation meter together at all times. The complete package makes you feel like you are holding an in-game item that should really have existed in the first place. Yet, its origin, purpose, and design are all completely original—it doesn’t rely on anything that already exists in the game. Rather, it has created its own purpose and story and is a celebration of the well-thought narrative of the Fallout series. We’ve all seen dive watches with helium escape valves, yet very few (if any) of us have experienced saturation diving first-hand. Even though Fallout is a fictional story, far more of us have experienced what it feels like to connect with the plot of that series. It’s more relatable, and in that way, we hope people will connect with the Laco RAD-AUX. 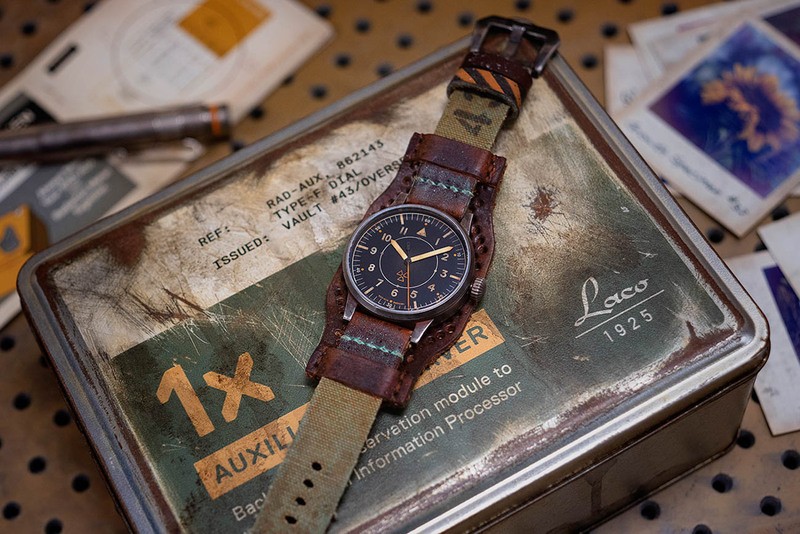 The Laco RAD-AUX watch kit, inspired by the Fallout game universe, will be produced as a limited edition of 143 pieces. Production on the full line will begin soon with orders expected to begin shipping in March 2019. The approved prototypes have already been completed and were used as the media for this advertisement. Retail price for the Laco RAD-AUX watch is $2,950 USD. 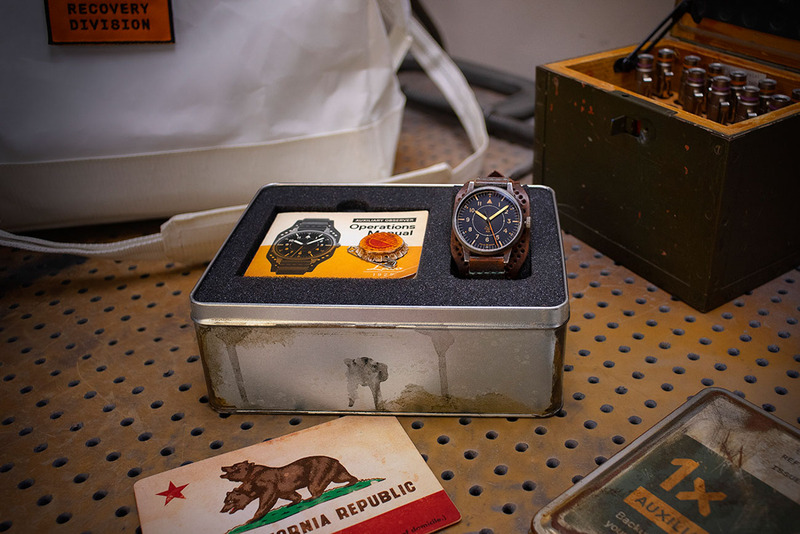 Each kit comes with the watch and specially made Fallout-themed accessories in an aged presentation box. Learn more or place your order here. Fallout computer game assets are the property of Bethesda Softworks. This product has no relationship with Bethesda and does not use protected marks. All intellectual property remains the property of its respective rights holders.